The stylish Thapovan Heritage Home, whose name means “the place where rishis meditate” is located in southern Kerala, 18 km from Trivandrum. Trivandrum airport can be reached in 35 minutes. The facility, which consists of individually designed, traditional houses, has a wonderful panoramic view of the Arabian Sea and is close to Nellikunnu Beach. For a morning bath, the pristine beach on the Malabar Coast can be reached in just three minutes. The Heritage Home concept of Thapovan offers a perfect setting for relaxation and regeneration amidst the lush tropical vegetation of southern India. 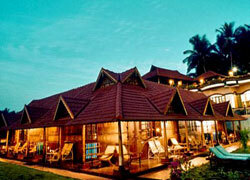 Guests can make use of the Ayurveda & Yoga Center, right on the beach, led by two experienced doctors. The proven, millennia-old Ayurvedic therapy cleanses the body of lifestyle- or environmentally induced deposits and rebuild one’s mental balance. 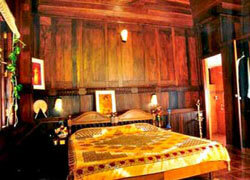 An Ayurvedic Panchakarma treatment is especially recommended. All therapists and staff members have a solid, traditional education. The Thapovan Heritage Home has a total of 32 accommodation units located either in a lush garden or overlooking Nellikunnu Beach. Thapovan offers the right accommodation for every taste. Guests can choose between garden cottages, teakwood houses, the traditional Old House (Nalukettu), the Hide Out in the upper compound, several beach cottages, a beach house and the Eagles’ nest near the sea. The traditional Kerala houses offer all the conveniences of a top accommodation and delight the senses with their tasteful furnishings. Particularly appealing are the aesthetics of the antique everyday objects such as the traditional Thookkuvilakkus, the South Indian hanging oil lamps. Thapovan’s restaurant places an emphasis on the traditional cuisine of Kerala, but also offers a variety of delicious European and Chinese dishes. With a range of excursions into the surrounding area, the Heritage Home likes to help its guests to familiarize themselves with the unique culture of South India and everyday life in Kerala. It is also possible to attend concerts, traditional festivals and dance events.